Ecard Mint, a company specialising in the design of corporate e-greetings, has introduced two new cards and a further ‘Employee’ category to its animated section. The Employee category provides an opportunity for small and medium sized businesses to acknowledge and show their appreciation to exceptional members of staff, to keep their morale high and to ensure that the best people feel valued and happy. Ecard Mint, a designer of quality company ecard communications based in Teddington has unveiled two new designs to launch the new Employee category of the animated branch of its eCommerce site. The ‘Congratulations on Your Promotion’ animations have been developed from the static ‘Team’ category of cards. Featuring illustrated office characters drawn in a retro style alongside greetings and messages, the static employee ecards have been created in consideration of a variety of workplace occasions such as welcoming new staff members or saying farewell to employees on their retirement. The new ecards feature male or female employee as they jump jovially beside the ‘Congratulations on Your Promotion’ message and dance to the upbeat music playing in the background. 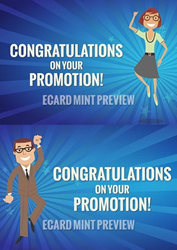 The addition of the new employee ecard category in the animated section of the Ecard Mint website is part of the company’s plan to offer a diverse range of email marketing communications suitable for both internal and external use. Managing Director of Ecard Mint, Nick Hellman comments: "The Employee category provides an opportunity for small and medium sized businesses to acknowledge and show their appreciation to exceptional members of staff, to keep their morale high and to ensure that the best people feel valued and happy in their organisation." He continues: "These ecards in particular encourage celebration of the important landmarks of employees’ careers within their company. And we always try and make our designs as versatile as possible, which is why we created one female and male version to offer a representative ecard for the newly promoted recipient." Ecard Mint are developing their animated range to incorporate more of the versatile static categories for business use, which include Announcement, Invitation and Appreciation ecards – as well as the ever-popular Christmas holiday and Birthday cards. Visitors to the site can preview and customise their chosen design before they sign up. Ecard Mint offer a ‘Pay As You Go’ payment option as well as Silver and Gold membership deals with discounts for users looking to send more than one ecard to employees, customers and clients. http://www.ecardmint.com is a provider of bespoke business ecards with over five years’ experience in the industry. Based in Teddington, the company was launched under Katie’s cards http://www.katiescards.com/ to offer a specialist B2B service for corporate greetings and marketing communications. For more information, follow Ecard Mint on Twitter.